All day, unmarked white vans and chartered buses carrying the migrant children released from shelters across the country roll into the parking lot of the Port Isabel Detention Center in south Texas. The U.S. government is racing to meet Thursday's court-ordered deadline to reunite migrant families who were separated at the border to discourage other illegal crossings. But the government has acknowledged many parents won't be able to rejoin their children. And for those parents who do get to be with their children again, the future is uncertain. The immigration bureaucracy on the border is a world of courtrooms and jail cells, asylum officers and gray-suited guards, and rarely, disorder. But no one has seen anything quite like this: immigration officials scrambling to reassemble the same families they broke up only two months ago. "It's a new set of rules, so the child advocates, the caseworkers, the immigration attorneys, we're all sort of figuring this out," says veteran immigration attorney Ruby Powers over a cup of coffee on her way to a detention center to see a client. "It's like we're building a plane while we're taking off. I feel like that this whole time." 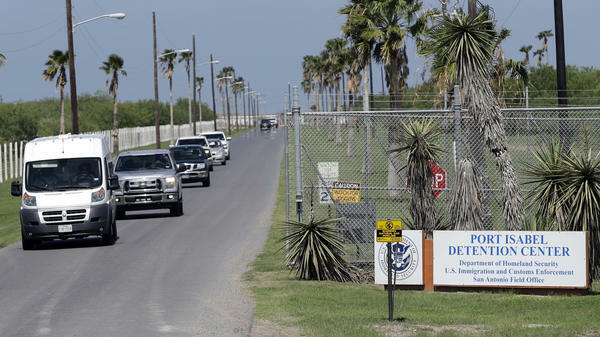 All day, unmarked white vans and chartered buses carrying the migrant children released from shelters across the country roll into the parking lot of the Port Isabel Detention Center in south Texas. It's a heavily-guarded compound on the South Texas gulf coast — just across the lagoon from tourists frolicking on Padre Island. Immigration and Customs Enforcement says, in a statement, these "large-scale transfers of minors" present "logistical challenges." But the agency says it's working "tirelessly" to reunite eligible families by Thursday's deadline. McAllen, Texas attorney Carlos Garcia says the government deserves some credit for the hustle. On Tuesday, he called a deportation officer at Port Isabel to find out when a client from Guatemala will be reunited with her daughter, who's en route from a shelter in Arizona. He was told officials were trying to make the reunification happen within the hour. "I mean, that's awesome. Good for them," he said, "The government sure is hauling trying to get these kids back with their parents. Now, it shouldn't be occurring. The government should've never have created this chaos and we wouldn't be in this situation, but I will give them credit." A California federal judge set today as the deadline for the Trump Administration to reunite more than 2,500 children — ages five to 17. The government said in a court filing earlier this week that as many as 1,600 parents should be back together with their children by today. But hundreds of parents won't be — 463 parents are no longer in the U.S. Many were deported. Lucy, a young mother from Honduras, was one of the lucky ones. Her lawyer declined to give her full name, saying she fears for her family's safety. She's back with her 6-year-old, Rudy. She's calling from her relative's house in Dallas. "I started to cry when I saw my son," she said in Spanish. "We hugged. He gave me a big kiss and said, 'Mommy, I missed you! And I love you so much! Let's go, mommy!' He wanted us to get out of there fast." Reunited families are housed on the shady campus of a religious shrine in the Rio Grande Valley owned by the local Catholic diocese before continuing their journey into the U.S. interior, with an ankle monitor and a promise to show up for their asylum hearings. While the family reunions are joyous, the harsh reality is that very few of these immigrants will be granted asylum, and be allowed to stay. Under new rules adopted by the Justice Department, which runs the immigration courts, most of victims of domestic abuse and criminal gangs no longer qualify for asylum. Many Central Americans are seeking protection because they say their own governments won't help them. At an immigration court inside Port Isabel Detention Center, Judge Robert Powell makes the final decision on asylum claims. He rejects eight out of 10 asylum claims. In courtroom audio from earlier this month obtained by CNN, Powell said what he often says in denying an asylum claim: "the decision of the asylum officer is affirmed and your case is returned to the Department of Homeland Security for you to be removed from the United States." On Tuesday, the last case of the day involved a man who says he fled Honduras after his mother was murdered in front of him by village thugs who had a vendetta against his family, and who vowed he was next. Powell told the man the same thing he tells other immigrants about to be deported: "I do wish you good luck in your home country." The Honduran man laid his head in his arms, and sobbed loudly as a security guard cleared the courtroom. The U.S. government is racing to meet today's court-ordered deadline to reunite migrant families. Children were separated from their parents at the border to discourage other illegal crossings. But the federal government has acknowledged many parents won't be able to rejoin their kids. And for those parents who do get to be with their children again, the future is uncertain, to be sure. NPR's John Burnett has our report from south Texas. JOHN BURNETT, BYLINE: The immigration bureaucracy on the border is a world of courtrooms and jail cells, asylum officers and gray-suited guards, and rarely disorder. But no one has seen anything quite like this - immigration officials scrambling to reassemble the same families they broke up nearly two months ago. Veteran immigration attorney Ruby Powers ponders it over a cup of coffee on her way to a detention center to see a client. RUBY POWERS: It's a new set of rules. So the child advocates, the case workers, the immigration attorneys, we're all sort of figuring this out. It's like we're building a plane while we're taking off. I feel like that this whole time. BURNETT: All day, unmarked white vans and chartered buses carrying the migrant children released from shelters across the country roll into the parking lot of the Port Isabel Detention Center. It's a heavily guarded compound on the south Texas Gulf Coast just across the lagoon from tourists frolicking on Padre Island. Immigration and Customs Enforcement says in a statement these large-scale transfers of minors present logistical challenges. But the agency says it's working tirelessly to reunite eligible families by today's deadline. Some families are taken together to be locked up in another detention center. Many are released on bonds. It's all happening so fast, some of their lawyers can't keep track of them. CARLOS GARCIA: Officer, this is Carlos Garcia. I'm an attorney in McAllen. And I have a question about a client of mine. BURNETT: Garcia calls a deportation officer at Port Isabel to find out when one of his clients from Guatemala will be reunited with her daughter, who's en route from a shelter in Arizona. Garcia turns to me after the call. GARCIA: He said we're trying to make the reunification happen within the hour. I mean, that's awesome. I mean, good for them, you know? The government sure is hauling trying to get these kids back with their parents. Now, it shouldn't be occurring. The government should have never created this chaos, and we wouldn't be in this situation. But I will give them credit. BURNETT: A California federal judge set today as the deadline for the Trump administration to reunite more than 2,500 children, ages 5 to 17. The government said in a court filing earlier this week that as many as 1,600 parents should be back together with their children by today. But hundreds of parents won't be. Four-hundred, sixty-three adults are no longer in the U.S. Many were deported. Lucy (ph), a young mother from Honduras, was one of the lucky ones. She's back with her 6-year-old, Rudy (ph). She's calling from her relative's house in Dallas, where they're staying. LUCY: (Through interpreter) I started to cry when I saw my son. We hugged. He gave me a big kiss and said, Mommy, I missed you and I love you so much. Let's go, Mommy. He wanted us to get out of there fast. BURNETT: Families reunited at Port Isabel go to a nearby Catholic charity before continuing their journey into the U.S. interior with an ankle monitor and a promise to show up for their asylum hearings. While the family reunions are joyous, the harsh reality is that very few of these immigrants will be granted asylum and be allowed to stay. Under new rules adopted by the Justice Department, which runs the immigration courts, most victims of domestic abuse and criminal gangs no longer qualify for asylum. Many Central Americans are seeking protection because they say their own governments won't help them. I spent a day in an immigration court inside Port Isabel Detention Center where Judge Robert Powell makes the final decision on asylum claims. CNN obtained this courtroom recording of Judge Powell earlier this month. ROBERT POWELL: The decision of the asylum officer is affirmed, and your case is returned to the Department of Homeland Security for you to be removed from the United States. BURNETT: Robert Powell rejects 8 out of 10 asylum claims. The last case of the day when I was there was a man who says he fled Honduras after his mother was murdered in front of him by village thugs who had a vendetta against his family and who vowed he was next. Powell told the man the same thing he tells other immigrants about to be deported, I do wish you good luck in your home country, where upon the Honduran laid his head in his arms and sobbed loudly as a security guard cleared the courtroom. John Burnett, NPR News, Port Isabel, Texas. Transcript provided by NPR, Copyright NPR.